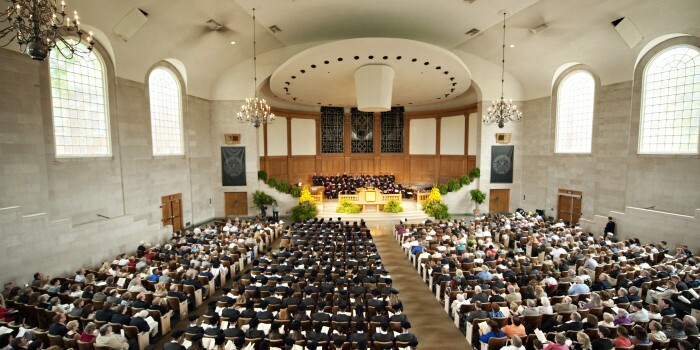 The Wake Forest University School of Law conferred hoods on 183 graduates on Sunday, May 19, in Wait Chapel. The graduates included the first two to earn the Scientiae Juridicae Doctor degree and the first nine to earn the Master of Studies in Law degree. Executive Associate Dean for Academic Affairs Suzanne Reynolds congratulated the class of 2013, which received a standing ovation from family and friends in the audience. Dean Blake Morant described this graduating class as being made up of a group of individuals who are going to contribute to society in a great way. A diploma ceremony was held in Wait Chapel this morning following Commencement exercises on Hearn Plaza. Dean Morant announced that the third-year graduating class chose Barbara Lentz as “Professor of the Year” and Officer Charlie D as “Staff Member of the Year.” Professor Mark Hall conferred the hoods. • Melissa Catherine Evett of Apex, N.C., received the American Academy of Matrimonial Lawyers Award from the North Carolina Chapter. • Rory P. Agan of Enfield, N.H., received the American Bar Association and The Bureau of National Affairs Award for Excellence in the Study of Health Law. • Jason Richard Weber of Elkhart, Ind., received the American Bar Association’s Section of Intellectual Property Law and The Bureau of National Affairs Inc. Award for the student who achieves the highest grade among the courses of Intellectual Property, Copyright and Trademarks. • Dustin Timothy Carlton of Murfreesboro, Tenn., and John William Forneris of Clifton, Va., received the American Bar Association and The Bureau of National Affairs Award for Excellence in the Study of Labor and Employment Law, which is given to the students who achieve the highest grades in the course. • Michael Dinesh Miranda of Morristown, N.J., received the Dean’s Award, which is given to honor the extraordinary contributions of a student leader. • Matthew Thomas Houston of Beulaville, N.C., received the E. McGruder Faris Memorial Award and $200 cash, which is given to the student exhibiting the highest standards of character, leadership and scholarship. • Kathryn Elizabeth Hatcher of Fuquay-Varina, N.C., received the Forsyth County Women Attorney’s Association Book Award, which is presented annually to an outstanding female graduate based upon her academic achievements, leadership, service to community, professionalism and commitment to the legal profession. • Maria Elizabeth Usher of Charlotte, N.C., received the Laura J. Gendy Award, a new award that was established by alumni, family and friends of Laura J. Gendy (JD’ 00) to provide an annual cash award in the amount of $500 to a graduating law student who exemplifies integrity, compassion for others and strength of character that were the hallmarks of Gendy, who died in August 2008. • Timothy Pennell Broyhill of Winston-Salem, N.C., and Margaret Ann McCall of Richmond, Va., received the Robert Goldberg Award in Trial Advocacy, which honors the memory of Robert Goldberg, a student at the School of Law, who was killed in World War II. It is an annual cash award in the amount of $3,000 given to the students showing the highest aptitude and ethics in trial advocacy. • Alexander S. Ingle of Wichita, Kan., received the I. Beverly Lake Award, which was established in honor of I. Beverly Lake Sr., professor of law at Wake Forest University, practicing attorney, assistant attorney general of North Carolina 1951-1955, and retired Justice of the North Carolina Supreme Court. The annual cash award in the amount of $500 is given to the student or students in the law school exhibiting the greatest proficiency in the study of Constitutional Law. • Aretina K. Samuel-Priestly of Saint Croix, Virgin Islands, received the National Association of Women Lawyers Award, which is presented annually to an outstanding law graduate at each American Bar Association-approved law school. • Kristina Marie Wolf of Westlake, Ohio, received the North Carolina State Bar Student Pro Bono Service Award, which is presented annually to a student who has contributed time and talent to law-related service. • Morgan Lewis & Bockius LLP received the Wake Forest University School of Law Service award, which recognizes extraordinary contributions to the law school’s program of legal education, faculty or students. Sager started his career with DuPont in August 1976 as an attorney in the labor and securities group. Sager helped pioneer the DuPont Convergence and Law Firm Partnering Program and continues to have oversight responsibility. Through his leadership, this program has become a benchmark in the industry and has received national acclaim for its innovative approach to the business of practicing law. He was named associate general counsel in 1994. In January 1998 he was named chief litigation counsel, where his responsibilities included oversight of all litigation and IS support for the entire function. He was named vice president and assistant general counsel in November 1999, and to his current position in July 2008.